Do your services eliminate manual solar panel cleaning? 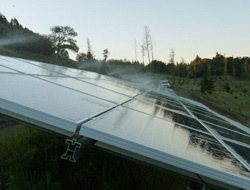 Yes, our solar panel cleaning systems eliminate the need for manual cleaning entirely. 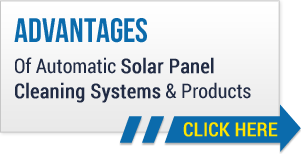 We offer state-of-the-art solar panel washing and cleaning equipment from the industry’s leading manufacturers for use on both commercial and residential solar panels. Whether you own or are leasing panels, we believe you will find our products incredibly effective in keeping your system clean and running optimally. Look to us also for anti-theft devices including Unirac security fasteners, Prosolar security fasteners and more. There is no reason to climb on to your rooftop and manually clean your panels when we offer such affordable and effective automatic washing options. Simply set your system for the times you want to clean and your work is done. Nothing could be easier! We offer professional installation, and can have your cleaning system up and running in no time. Call today! Nobody enjoys the time and effort manually cleaning your solar panels requires. It is an arduous job, and involves risk in that you are climbing around on your rooftop while hoping you don’t fall or do anything to damage your panels. Heliotex is here to tell you there is an easier way. A clean solar panel is a healthy solar panel, and a healthy solar panel elicits the level of production you paid to receive. We have worked with manufacturers, engineers and government agencies to develop systems that represent the very best our industry has to offer. Make certain that the next person to manually clean their solar panel system isn’t you by calling Heliotex today. If you are forward thinking enough to have installed solar panels at your home or business, we know that you are aware of the importance of keeping them clean. Consider Heliotex a partner in your efforts, and an affordable one at that. Our solar panel cleaning systems are state-of-the-art, and one is waiting for you today. Isn’t it time you made the call?